This �round-the-world� adventure rally may be right up there with being a civilian on a space shuttle. MIR Corporation http://www.mircorp.com/, a US-based specialist in active and cultural travel to Russia, Central Asia and Eastern Europe, is offering John Q Public a chance to ride or drive from Beijing to Paris as part of World Race 2011 � New York to Paris. http://www.world-race.net/. Japan's seven big automakers are extending nationwide production shutdowns amid growing concern about supply chain interruptions, power shortages and export difficulties following the massive earthquake and tsunami that hammered northern Japan, killing thousands. Toyota Motor Corp., one of the few automakers with a major manufacturing presence in the quake zone, suspended all manufacturing � at both assembly and parts plants � on Monday and extended the shutdown through at least Wednesday as an added precaution. The company will lose output of roughly 40,000 vehicles over the three-day period, spokesman Dion Corbett said. Carmakers are halting production � even at plants not affected by Friday's 8.9-magnitude monster quake � partly to give workers time to regroup with families. Thousands of people in northern Japan are still unaccounted for, as authorities predict a death toll exceeding 10,000. But the country's supply chain has also been slammed � with automakers still unable to make contact with some parts makers in the quake zone three days after Friday's disaster. There is also concern about export shipments being interrupted by tsunami damage to the nation's ports. U.S. production may even be hit if plants there can't get parts normally imported from Japan. Mitsubishi Motors Corp. had already announced it would stop production at all its factories through Tuesday. By Monday evening, Honda, Nissan, Subaru and Suzuki, said shutdowns initially planned only for Monday would be extended to later in the week. Mazda, which continued output for a half-day Monday, joined the wave of suspensions. All plants at Honda Motor Co. will remain off line through at least Sunday, March 20. It expects to lose about 16,600 units of auto production. About 2,500 of those vehicles � including the Fit small car, Insight hybrid and Acura RL � would have been bound for the United States. Honda has 113 suppliers in the quake zone and still can't get in touch with 44 of them. "We cannot complete a car, even if one or two parts are missing," Honda spokesman Keitaro Yamamoto said. "So it's better that we stop production altogether." Nissan is closing its Tochigi assembly plant and an engine plant � both in the quake zone � at least through Friday. Elsewhere in the country, it is closing four assembly plants and one engine factory through at least Wednesday. The company wouldn't say how many units of production it expects to lose or how its U.S. exports may be affected. Suzuki Motor Co. announced it would extend its suspension through Wednesday and reassess then. Even Mazda Motor Corp., whose base of operations lies in far-western Japan where the quake was barely felt, said it was suspending the Monday night shifts at its two assembly plants and asking workers at both shifts to stay home Tuesday and Wednesday. "We are expecting shortages of certain parts, such as steel plates and brake parts, to name a few," spokesman Kotaro Minagawa said. Mazda's shutdown affects every model it sells in the Untied States, except the Mazda6 sedan, which is made in Michigan at its joint venture plant with Ford Motor Co.
Fuji Heavy Industries Ltd., maker of Subaru brand cars, was among those extending Monday's shutdown through Wednesday. That move affects U.S. exports of the Forester and Impreza. Mitsubishi said it had secured enough parts to resume production Wednesday. But production plans for Thursday and beyond would have to be assessed at a later date, it warned. Even U.S. output at Japanese-brand plants may be hurt if parts exports are pinched. "Overseas production could be affected as well if shutdowns become prolonged, as core components such as engines and transmissions are supplied to overseas vehicle factories from Japan," predicted Kohei Takahashi, an auto analyst with J.P. Morgan Securities in Tokyo. "Given the 20,000 to 30,000 parts that go into making an automobile, and the difficulty of procuring even basic materials, we do not foresee a return to normal production schedules anytime soon," he wrote in a report, adding he saw little lingering long-term industry damage. The looming memory is the supply chain breakdown triggered by an earthquake in Japan's northern prefecture of Niigata in 2007. That quake damaged plants at just a handful of key suppliers, most notably the piston ring maker Riken. The ensuing parts shortage set back nationwide auto output by 125,000 units, notes Japan's Nikkan Jidosha industry newspaper. Even if the cars can be built, sending them overseas is another hurdle. Nissan Motor Co.'s export facility at the Port of Hitachi, for example, was clogged with thousands of damaged or burned-out cars after being slammed by the tsunami's wall of water. It is believed the inferno erupted after the cars were smashed together triggering fuel leaks. Toyota said it was still gathering information on how its exports might be affected. Meanwhile, rolling power shutdowns throughout eastern Japan have been implemented by the local utility, Tokyo Electric Power Co., to save electricity. Power output capacity has been slashed because many generation plants � including nuclear � were damaged in the disaster. Engineers are racing to prevent meltdowns in at least two reactors at one nuclear plant. Authorities have expanded the evacuation zone to a 12-mile radius around one site. Small amounts of radiation are already leaking, following explosions at two of its reactors. The planned blackouts have crimped business operations as well as interrupted train services, making it difficult for many employees to report to work. Reported gasoline shortages, triggered by damaged refineries, have further contributed to a logistical and transportation snarl. Meanwhile, automakers are also concerned about additional damage to plants from strong aftershocks, which continued rocking the region through Monday evening, with new earthquakes cropping up in different regions of the country. In 1995, the general manager of The Ritz-Carlton, Amelia Island, Michael Carsch, had a challenge. He had a beautiful oceanfront Ritz-Carlton, only a few years old, and each year he struggled to fill rooms when warm spring weather first arrived on the island. He also knew most people were not familiar with Amelia Island, Florida. Carsch wanted to create an event that would attract a luxury crowd each year. He tracked down a local car collector, Bill Warner, who had a reputation as a passionate car guy. Warner, a successful businessman, photographer and writer for Road & Track, was being urged by other auto enthusiasts to create a classic car show in Florida. 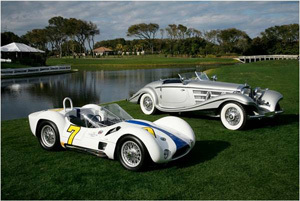 With The Ritz-Carlton, Amelia Island and Mercedes-Benz as inaugural sponsors, Warner launched the Amelia Island Concours d�Elegance. The first car show featured 125 cars, world-famous Grand Prix driver Sir Stirling Moss as Honorary Chairman, and drew about 2,000 car enthusiasts. It also sold out The Ritz-Carlton, Amelia Island. Fast forward to 2011, the Amelia Island Concours d�Elegance is entering its 16th year, and is now considered the most prestigious show on the east coast. Collectors consider it one of the big events of the year along with Pebble Beach in California, Meadow Brook in Michigan and Louis Vuitton Classic in midtown Manhattan. They will be joined by an estimated 15,000 enthusiasts who will walk the Concours on Sunday. This year they will see 255 high quality rare cars competing for ribbons in the Concours d�Elegance which literally means �a competition of elegance.� Collectors, who are invited to the show, watch as a team of judges rate their cars for authenticity, function, history, style and quality of restorations. Any imperfection requires a fractional point deduction. Why do collectors subject themselves to the rigor of a Concours competition? For some it is a hobby, they are proud to own a piece of history and want to share their car with other enthusiasts. For others, it is a business investment that can offer a higher return than the stock market. Last years auction sold more than $19 million in rare cars in a single day. But for all, it is a social gathering that celebrates automotive history.